The city of Fall River, situated where the Taunton River flows into Mount Hope Bay, was known as the "Textile Capital of the World" in the nineteenth century. At one time, more than 100 cotton mills in Fall River employed over 30,000 people. The city's location allowed easy travel by water to Providence, Newport, and beyond. Beginning in 1847, the Fall River Line of steamships provided a link to Boston and New York City. 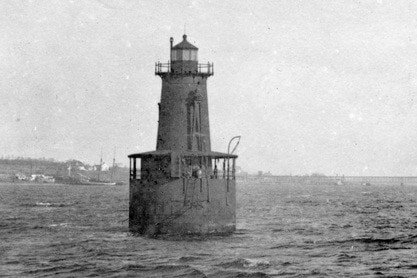 For a number of years before the lighthouse was built to warn of a dangerous reef at the mouth of the Taunton River, an unlighted day beacon marked the spot. The 1872 annual report of the Lighthouse Board described a "stone beacon, with iron column and day-mark." On June 16, 1880, a sum of $25,000 was appropriated for a lighthouse on Borden Flats, and construction soon commenced. A cylindrical cast-iron caisson was sunk in place on the reef and then filled with concrete. The components of the superstructure were delivered in July 1881. The cast-iron tower, which doubled as living quarters for its keeper, was erected on the caisson, and the light went into service on October 1, 1881, with a fourth-order Fresnel lens producing a fixed red light 47 feet above mean high water. A fog bell, with automatic striking machinery, was installed on the side of the tower. There were five stories above the basement, including the lantern, with; two levels were used as living quarters. Rainwater was collected in gutters and deposited into a cistern in the structure's basement level, providing the keeper's water supply. 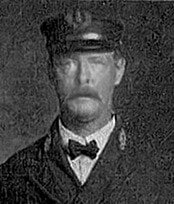 John H. Paul became keeper in July 1912 and remained at Borden Flats Light until 1927. On August 3, 1912, two men were passing near the lighthouse in a rowboat. As the men attempted to change places, the boat overturned. Keeper Paul saw the accident and immediately launched his boat. One of the men was unable to swim and was lost in the waves. The other man clung to the overturned boat and was swiftly rescued by Paul. The keeper later received a bronze Carnegie lifesaving medal for this rescue. The lighthouse was battered in the Great Hurricane of September 21, 1938, as were most lighthouses on New England's south-facing coast. The storm left the tower with a pronounced 5 degree tilt, which is still visible from the west side. A new, much wider cylindrical caisson was subsequently added around the old one to provide more protection. Truman Sawyer served at Borden Flats Light for the Coast Guard from November 1955 to December 1956. 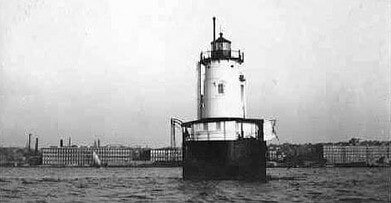 In a phone interview in 2003, he recalled that there were usually two men at the lighthouse at a time, and that the crewmen had six days at the lighthouse followed by two days off. The light still ran on kerosene, as did a refrigerator and stove. The fog bell mechanism was still wound by hand. Although he looked back on the experience fondly, Sawyer said that at the time "it was like punishment." Borden Flats Light was finally electrified in 1957 and in 1963, full time Light Keepers left the Light when it became automated. In 1977, the Fresnel lens was replaced by a modern plastic lens. The fog bell remained in use until 1983 when it was replaced by an electronic foghorn. Today, the Light sits proudly about a half mile south of the Braga Bridge. The bridge, built in 1965, was named for one of the first men from Fall River to die in World War II. 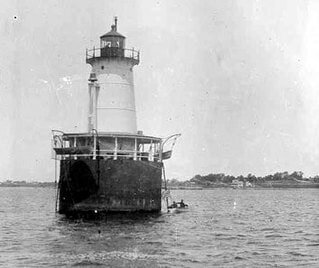 Borden Flats Light remains an active aid to navigation, serviced by the Coast Guard's Aids to Navigation Team Bristol (Rhode Island). Coast Guard personnel completed some renovation of the exterior and interior in 2002. In September 2006, it was announced that the lighthouse would be available for transfer to a suitable buyer under the provisions of the National Historic Lighthouse Preservation Act of 2000. No one expressed interest, so the lighthouse was deemed available to be sold at auction to the general public. In September 2008, the high bidder was attorney Michael Gabriel of Carson City, Nevada, at $55,000. In June 2010, it was announced that Mr. Gabriel had failed to close on the property, and that it would be auctioned once again. In August 2010, the high bidder of the second auction was Nick Korstad of Portland, Oregon. “I want to restore it back to what is was originally and I want to make it accessible to the public,” Korstad told the Fall River Herald News. The young Korstad moved himself cross country and lived in the lighthouse while pain-stakingly renovating and rehabbing the entire structure. His effort stands as one of the finest lighthouse rehabilitation successes in all of North America. He tirelessly devoted 8 years, (nearly single-handedly) to its complete renovation, and as promised, opened her up to the public for tours and overnight stays. He has successfully operated his popular Lighthouse Keepers Overnight Program, allowing guests to live the life of an historic Light Keeper. The Overnight Program books up for the entire 7 month season, so it is wise to make reservations as early as January for the coming season. As of May, 2018, Nick sadly said goodbye to his Borden Flats Light as he moved on to his next lighthouse adventure, a 7 bedroom lighthouse in Michigan that is currently a full service bed & breakfast call Big Bay- www.bigbaylighthouse.com. Borden Flats Light now has a new passionate owner and light keeper, local resident Kevin Ferias. Kevin has vowed to keep the Light active and available to the public for overnight stays through the immensely popular Keepers Program. Guests are transported by launch to the Light and afforded an experience they wont soon forget, living just like Light Keepers have since 1881. Guest Keepers come from all over the country and beyond to live this once-in-a-lifetime experience! From 1881 to present, the Lighthouse remains an active US Coast Guard Aid to Navigation (ATON) and the beacon is managed by the US Coast Guard on a regular basis . It can be best seen from the Borden Light Marina. While in Fall River be sure to visit Battleship Cove, home port to the Battleship Massachusetts. The excellent Fall River Marine Museum is also nearby, featuring an extensive Titanic exhibit. Another fav is the Lizzie Borden House & Museum. We are conveniently located just 50 miles south of Boston, 35 miles west of Cape Cod, 17 miles east of Providence, RI and the famous seaside resort of Newport, RI is only 20 miles south! John Paul, our heroic Light Keeper from 1912-1927 who's spirit is still protecting the Lighthouse! Nick Korstad, our hero for restoring "The Light" to her present beauty! 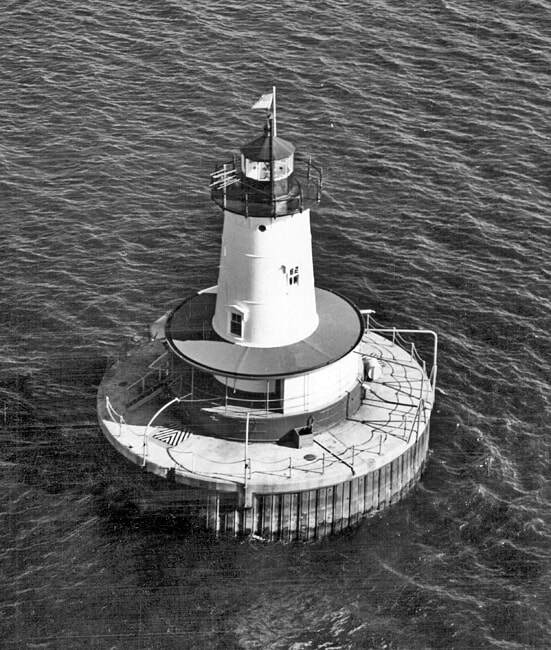 In 1977 our 4th order Fresnel Lens was replaced with an Amerace FA-251 rotating beacon. The lighthouse is fully powered by several 35 watt solar panels. Installed in 1996, our VRB-25 lens was removed in 2017 and replaced with a VLB-44 Optic. Chief David of ATON Bristol performed the upgrade. 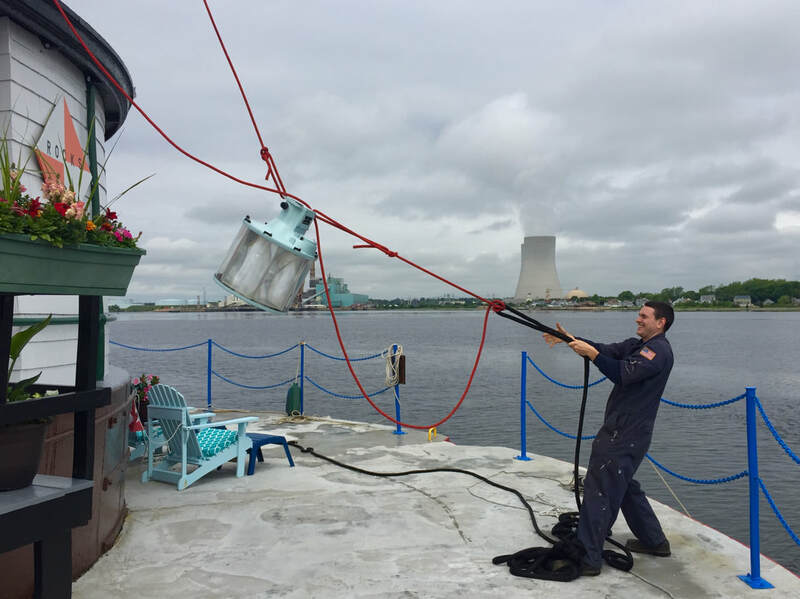 ATON - Bristol, RI removed our VRB-25 via rope and pulley from the lantern deck. Our current modern VLB-44 LED optic as seen from our lantern room, installed in 2017. Open to the Public? YES - Overnight stays available to public from April-November. Miscellaneous: The lighthouse is privately owned and open to the public for overnight stays, but the light is maintained by the U.S. Coast Guard Aids to Navigation team in Bristol, RI. *The majority of the information has been provided by the National Park Service and edited to current specifications.